Another joyful rubber-ball baby boy from Contessa. 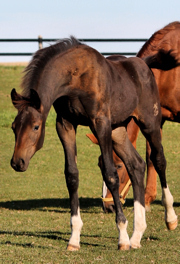 Her foals always put a smile on my face with their happy, inquisitive natures, their joy of movement. This little guy has come out, “all-singing, all-dancing” just like his siblings before him. 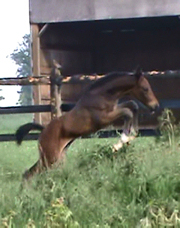 Masculine, refined type, leggy and athletic, he will shine in the arena, and make his new owner smile every day too. Pictured here 2 weeks to 2 months old. Spiderman will be going to a wonderful home in Ontario – to a dedicated and talented rider, and a family who have already taken Spidey into their hearts. 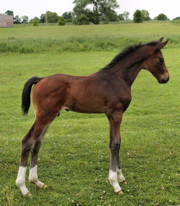 UPDATE: On September 12th, at the large Parkwood Inspection site (23 foals presented), SpiderMan was selected Champion Hanoverian Dressage Foal 2012, praised for his elastic, active gaits, his type and presence. In July 2015, Spider-Man started dressage training. 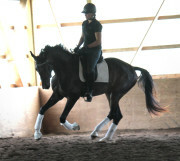 He is proving to be so rideable, so willing, with big, lofty gaits. Shown here, at 3 years old.